Last Friday, we saw the S&P 500 tick at all time highs for a few seconds. That’s anything but unexpected and certainly not newsworthy. What was “different this time” was that it was the only major index to score new highs before they all reversed sharply to the downside. That made calling for an overall market pullback fairly easy. Over the past few days, the high flying, momentum driven tech stocks, like Google Netflix and Amazon have come under strong pressure, following in the footsteps of the biotech group which has fallen sharply since mid February. This type of action is usually seen near the end of routine bull market pullbacks (3-7%) and not at the onset. The leaders are typically thrown out after selling hits other areas of the market. Impressively, the stock market has been resilient in the face of than overwhelming economic data and some worrisome geopolitical events and news in China, Middle East and Ukraine. Bullishly, stocks continue to hover around their average price of the past 21 days or one month of trading. At this point it looks like the next 2-3% move can be faded, meaning that whichever direction the market goes in the short-term should be temporary and will then go in the exact opposite direction. Longer-term, the bull market remains alive and well, albeit old and wrinkly. The ingredients normally seen before a bull becomes a bear remain nonexistent, in spite of what may be said by the pundits. In fact, I don’t even see the usual caution signs for 10%+ correction. Buy the dips and sell the rips is the strategy to continue following until proven otherwise. Outside the stock market, I remain on breakout watch for long-term treasury bonds, our largest position in our global macro strategy. I have been generally bullish on long dated T bonds since late last year when you couldn’t find anyone who was positive. In the middle of last week, I posted a piece about the potential for a very short-term rally, which you can see here, http://investfortomorrowblog.com/archives/1002. Stocks had come down very hard and very fast relative to what we have seen over the past year. I didn’t believe the ultimate low was seen, but the market could certainly bounce for a few days to a week. It’s a week later now and boy did the market bounce! The NASDAQ 100 even made it to a new high for 2014, although the other four major indices I regularly discuss still have a ways to go. Market sentiment never got truly dire a week ago, just a bit pessimistic, and now it’s back to the bullish side of neutral. While price has pretty much rallied in vertical fashion, market internals have been underwhelming, meaning that the foundation of the rally is shaky. The market is now in the zone where the rally is supposed to end, IF it’s going to end before new highs. 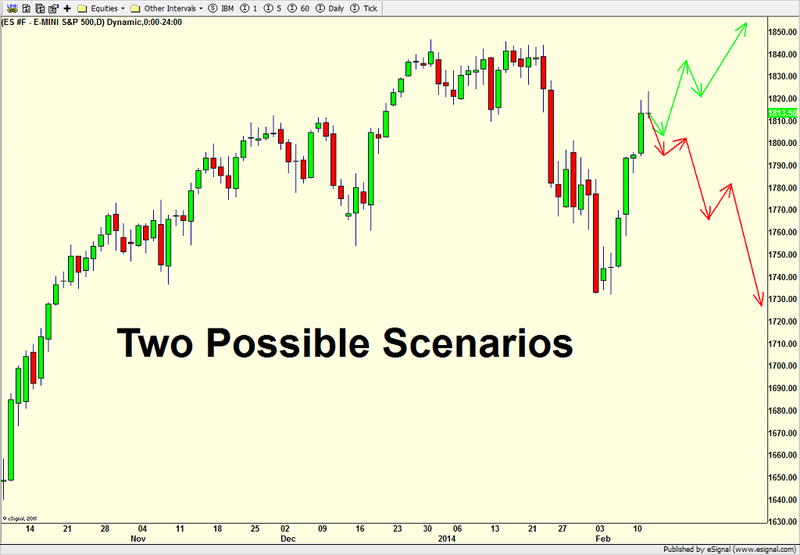 See the chart of the S&P below with the two possible scenarios. Today is Jobs Friday and the pundits are usually out in force predicting the number of non-farm payroll jobs created. That’s one area I usually steer clear of as it is probably the most volatile, inconsistent and unpredictable economic number of the month. What’s even more futile is forecasting the market’s reaction, which is sometimes a head scratcher. Last month’s number was a complete and utter disaster, but the stock market barely shrugged and tested the highs the following week. I keep hearing people blaming one area that is totally defenseless, Mother Nature. It seems like whenever the pundits are stumped, they blame the weather. Given the trend, last month’s number is supposed to be an outlier that potentially gets revised upward today with at least a decent number. As I said, this is all just guessing. We will see shortly. Regardless of the number, I do not believe for a second that it will alter the Fed’s tapering course, although as you know, I vehemently disagree with any taper! In yesterday’s pre-market piece, http://investfortomorrowblog.com/archives/1002, I spoke about a very short-term rally beginning and the market did not disappoint. I do not believe THE bottom is in, but the bulls can certainly push a little higher if they want to today. This remains a “sell the rally” market until we do a better job of rebuilding the wall of worry. Sentiment numbers are well on the way and should be there with another push to new 2014 lows. Here is the link to the segment I did on Fox Business the other day with Lori Rothman and Adam Shapiro. This pretty much spells out what I have written here regarding my thoughts on the market this quarter. Thanks to Adam and Lori for letting me articulate my forecast. Stock market action over the past two days gives a glimmer of hope to the bulls for a short-term rally. I do not believe the final bottom is in as I have mentioned before, but this is one of those times where the bears look a little tired and should let the bulls make a little noise. Some of the sentiment indicators are showing some excessive very short-term pessimism that could support a move, but given that I remain negative for more than a trading rally, holding above this week’s lows are key to that scenario. If the major indices close below those levels, the bears should quickly attack and it could be ugly. In a perfect world, which, seriously, when do I ever get; stocks would rally for a few days to a week and then rollover again to new lows. Those lows would see some panic, much more negative sentiment, but not as negative technical indicators than earlier this week. Then we would have the ingredients in place for a better rally. That all sounds really nice, but Mr. Market rarely gives us exactly what we want. For now, if we do get a rally, I am keenly focused on the quality of the move. As I mentioned on Twitter yesterday, the biotech and transportation sectors look like they are worth a “poke” on the long side as long as they do not close below Wednesday’s low. Everyone is focused on tomorrow’s monthly employment report after the disastrous one we had last month. My initial take is that this report will be decent and we will see upward revisions from last month. This report is so beyond volatile, inconsistent and unpredictable, let alone trying to interpret the market’s reaction beforehand. 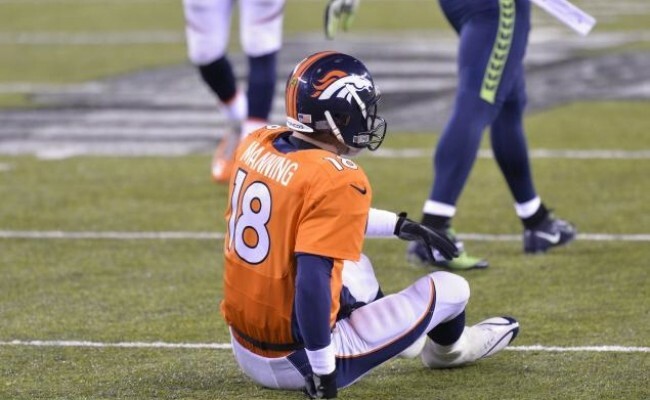 After that “thrilling” Super Bowl, the markets come back to work kind of like Peyton Manning, battered, bruised, beaten up and in need of some TLC. Unfortunately, any TLC seen in the stock market should only be temporary and lead to more selling and lower lows. I am starting to see some constructive things, but the market isn’t there yet. Downside targets are beginning to develop and the easiest one in the S&P 500 is the 1700 area, which represents a measured move as well as the widely watched 200 day moving average. That area falls nicely into what I forecasted to begin the year, a 5-10% pullback. For now, keep your powder dry as we are and look forward to buying at much lower levels that the pundits predicted just one month ago! 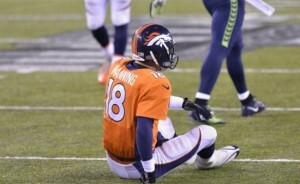 Thanks to my friend and business colleague/partner Dave Moenning (stateofthemarkets.com) for the Peyton pic. Stocks are opening sharply higher after Wednesday’s drubbing. We have not seen the ultimate low for a good rally. That looks to come in February. This little rally should be more than a one day wonder, but if it somehow fizzles out and closes in the red today, look out below! I think you could see one of those trap door, elevator shaft declines that forces a mini panic. I don’t think that scenario plays out, but it’s something to watch today. The latest Street$marts has been posted. The stock market is tired, again. That seems like a phrase I have used often this year without much follow through. There have been many times in 2013 when the market had risen sharply and then looked just plain weary. Instead of correcting or even pulling back smartly, the stock market behaved like it does when it’s in a powerful bull trend; it’s consolidated sideways within a few percent of its high and then blasted off again. “Is this time different?” That’s one of the scariest phrases in our business! The only difference I see now with other 2013 overbought markets is that sentiment is now and has been at rally killing levels, something I mentioned on CNBC and Fox Business over the past few weeks as well as here and in Street$marts. If this was not early December, I would have much stronger conviction to be negative, but it’s almost unheard of to see a meaningful peak or significant decline at this time of the year. That’s tough to ignore. While I absolutely hate when people say they are “cautiously optimistic”, I will say that I am a nervous bull who is dancing very close to the door. So here we are, during the most positive time of the year. Something like 8 of the last 10 Decembers have been up. Stocks are at all time highs. There is no impetus to sell. There are few downside catalysts. Even the bears are bullish until January. Yet all is not right. Today (December 2) and tomorrow are historically very good days in the market. Stocks opened well and moved higher into lunch, but then the bears tried to make another stand. This time, they were successful, closing the market just off the lows of the day and ending with a semi nasty looking candlestick on the daily chart. If we do not see an immediate about face on Tuesday, the evidence will point to a sometimes typical early December pullback of 2-5% that should bottom within five days of option expiration on the 20th. Don’t forget there is a two day Fed meeting on the 17th & 18th where taper talk will be all the rage. What a great excuse for a low if the market sold off into that meeting! While small caps and technology have led the rally for the past few weeks, it looks like they are trying to cede leadership to large and mid caps. 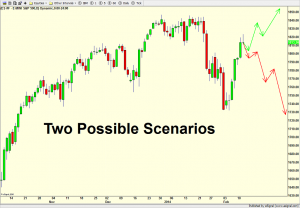 IF there is a pullback and IF the small caps and tech underperform for a week or two or so, that would set up such a nice trade into January for buying the Russell 2000, S&P 600 and NASDAQ 100 for the final 5-10 days of the year. There is also a tendency for the semiconductor group, which leads tech, to perform poorly over the next two weeks. It would all fit together nicely. But that is putting cart so far in front of the horse. Let’s wait and see what happens over the coming few days. There is no need to push and rush here as stocks are extended and tired regardless. On a separate note, gold was bludgeoned today and is now set up to see sub $1200 sooner than later. Sentiment has been worse than awful, but even that hasn’t been able to thwart the bears. At some point it is going to matter, but that will likely be from lower levels on the metals and perhaps all time bearish levels of sentiment. I hope you had a meaningful and fantastic Thanksgiving! Happy Hanukah to those who celebrate! !